I am in adamant denial that summer is only two weeks from ending. Even while typing that, I blindfolded myself and thought about rainbows and sunflowers so I could trick myself that it was just a "pretend." This summer has been full, and busy, and not, all at the same time. July was travelling and visiting and getting sick, a cold that worked its way through our entire household and didn't move on for about a month. What is it about summer colds that makes them hang on so long, anyway? Combine that with the heat wave that we endured for most of the month, and on into the first part of August, making our li'l Tin Can o' Dreams a mere 30C+ by evening every night, and most of the summer "to-do" list didn't really start getting tackled until the August long weekend (first weekend, for those not Canadian-holiday-aware). So, what did we do while we were coughing, and sweltering, through July? Next two weeks: Veg. Recover. Read. KNIT. I read several books this summer. The whole 12-month "Conspiracy 365" series (preview for Jude, ostensibly. Not bad--a little "mile-a-minute" for my tastes, but good adventure for teen and pre-teen reading.) After that, I read "Wicked: The Life and Times of the Wicked Witch of the West" by Gregory McGuire. This is the novel that the musical "Wicked" is based on. While I enjoyed the skill of the writing, and seeing how the source material was changed to create the musical, I was disappointed in the vulgarity of the book--about an "R" rating. Oh, well. Since then, I have been working through "Which Lie Did I Tell? ", William Goldman's sequel to "Adventures in the Screen Trade" about his life as a screenwriter. The skirt of the sundress was very boring. Since I was reading "Wicked" on the Kindle app on my phone and PC, and therefore didn't need hands to hold a book open (and only a light touch to "turn pages"), I also got a great deal of knitting done while I was reading. This was a new trick for me, but I found it worked well to keep my mind occupied while my fingers were doing the same repetitive stitch for hours. 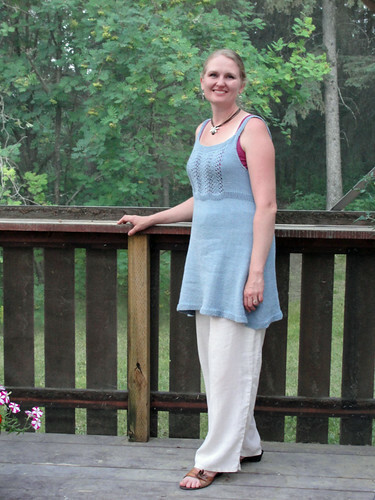 Here's the story of the sundress: I actually started it early last summer (2011), very excited about the slight challenge the lace bodice would supply, and the prospect of making myself a summer garment. (I don't usually knit summer dresses, I sew them.) Last summer, as you all know, was more than a little busy with moving, renovating, and the like. So, I didn't really put any speed on with the project until the week between Christmas and New Year's, when Jason was off of work and we were watching movies every night, with not much to do all day but knit, either. By the end of the week, the skirt was nearly finished when I realized I had made two fatal errors: my gauge had loosened considerably from when I started the project, meaning the fit would be off, and I had also cast on the wrong number of stitches in the first place. I was so grouchy about it, I stuffed the whole thing into my knitting bag and didn't touch it again for months. This spring, I was finally over my "irk" enough to rip it out and prepare to re-knit. I (re)cast this on the third weekend of June, and finished it by the end of July. I am SO glad it is done, it fits (maybe a touch loose, but nothing major), and I can move onto something else. Like this sweater for Jason, for which I just ordered the yarn.